Messrs. Ricci, Czanek, and Silva selected the night of April 11th for their call. Mr. Ricci and Mr. Silva were to interview the poor old gentleman, whilst Mr. Czanek waited for them and their presumable metallic burden with a covered motor-car in Ship Street, by the gate in the tall rear wall of their hosts grounds. Desire to avoid needless explanations in case of unexpected police intrusions prompted these plans for a quiet and unostentatious departure. As prearranged, the three adventurers started out separately in order to prevent any evil-minded suspicions afterward. Messrs. Ricci and Silva met in Water Street by the old man's front gate, and although they did not like the way the moon shone down upon the painted stones through the budding branches of the gnarled trees, they had more important things to think about than mere idle superstition. They feared it might be unpleasant work making the Terrible Old Man loquacious concerning his hoarded gold and silver, for aged sea-captains are notably stubborn and perverse. Still, he was very old and very feeble, and there were two visitors. Messrs. Ricci and Silva were experienced in the art of making unwilling persons voluble, and the screams of a weak and exceptionally venerable man can be easily muffled. So they moved up to the one lighted window and heard the Terrible Old Man talking childishly to his bottles with pendulums. Then they donned masks and knocked politely at the weather-stained oaken door. Waiting seemed very long to Mr. Czanek as he fidgeted restlessly in the covered motor-car by the Terrible Old Man's back gate in Ship Street. He was more than ordinarily tender-hearted, and he did not like the hideous screams he had heard in the ancient house just after the hour appointed for the deed. Had he not told his colleagues to be as gentle as possible with the pathetic old sea-captain? Very nervously he watched that narrow oaken gate in the high and ivy-clad stone wall. Frequently he consulted his watch, and wondered at the delay. Had the old man died before revealing where his treasure was hidden, and had a thorough search become necessary? Mr. Czanek did not like to wait so long in the dark in such a place. Then he sensed a soft tread or tapping on the walk inside the gate, heard a gentle fumbling at the rusty latch, and saw the narrow, heavy door swing inward. And in the pallid glow of the single dim street-lamp he strained his eyes to see what his colleagues had brought out of that sinister house which loomed so close behind. But when he looked, he did not see what he had expected; for his colleagues were not there at all, but only the Terrible Old Man leaning quietly on his knotted cane and smiling hideously. Mr. Czanek had never before noticed the colour of that mans eyes; now he saw that they were yellow. Little things make considerable excitement in little towns, which is the reason that Kingsport people talked all that spring and summer about the three unidentifiable bodies, horribly slashed as with many cutlasses, and horribly mangled as by the tread of many cruel boot-heels, which the tide washed in. And some people even spoke of things as trivial as the deserted motor-car found in Ship Street, or certain especially inhuman cries, probably of a stray animal or migratory bird, heard in the night by wakeful citizens. But in this idle village gossip the Terrible Old Man took no interest at all. He was by nature reserved, and when one is aged and feeble, one's reserve is doubly strong. Besides, so ancient a sea-captain must have witnessed scores of things much more stirring in the far-off days of his unremembered youth. 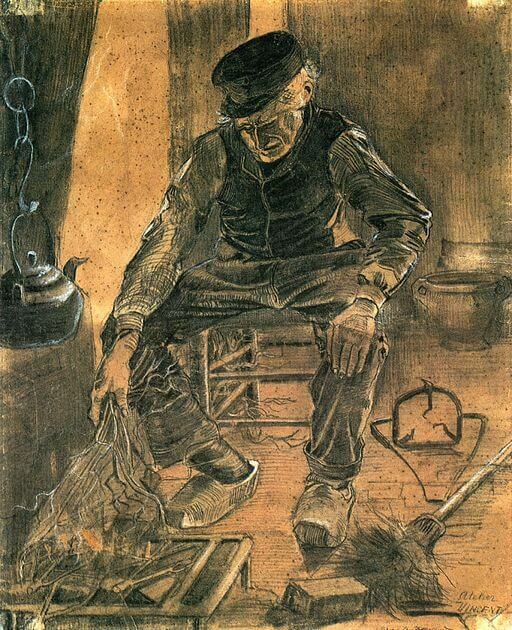 The Terrible Old Man also makes an appearance in Lovecraft's story The Strange High House in the Mist. This story is featured in Gothic Literature Study Guide and our collection of Short-Short Stories to read when you have five minutes to spare. Add The Terrible Old Man to your own personal library.